The B side is forgettable, but the A side "Stan’s Plan" is the one. Ever seen one of those old American ‘B’ movies in your childhood where you cannot really remember what it about let alone called. Just a lot of long sorrowful driving scenes through mountainous woodland with rusty autumn leaves lining the roads, the music played by some obscure band adlibbing over the top. Well this tune is that; comforting warm strings and gentle soothing sounds melt into a 70's ice cream dream, the beats not distracting from the tearfully sweet melody and keep you nodding along in awe to this sublime masterpiece. 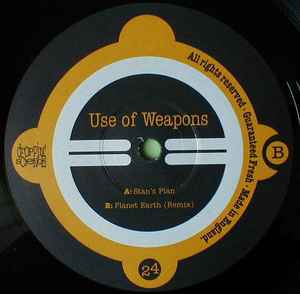 Those who like this kind of flavour should check Use of Weapons other 12" on Droppin' Science -'Switchblade'.